This is the chocolate cake and icing of my dreams. Last year, I happened upon a chocolate cake recipe by Smitten Kitchen and was immediately, well, smitten. The only problem was that it made SO MUCH CAKE (two 10-inch round cake pans). I rarely make cakes that large – I bet most of you don’t either. So whenever I made this recipe, I found myself baking for hours to get through the batter with my small cake rounds and then would have tons of extra cake leftover. And I don’t know about you, but if there’s extra cake just sitting around, that’s a dangerous situation for my waistline! So with St. Patrick’s Day approaching and my desire to create something combining my favorite liqueur, Bailey’s Irish Cream, with chocolate, I decided it was the perfect time to modify the Smitten Kitchen recipe and make about half the batter of the original. 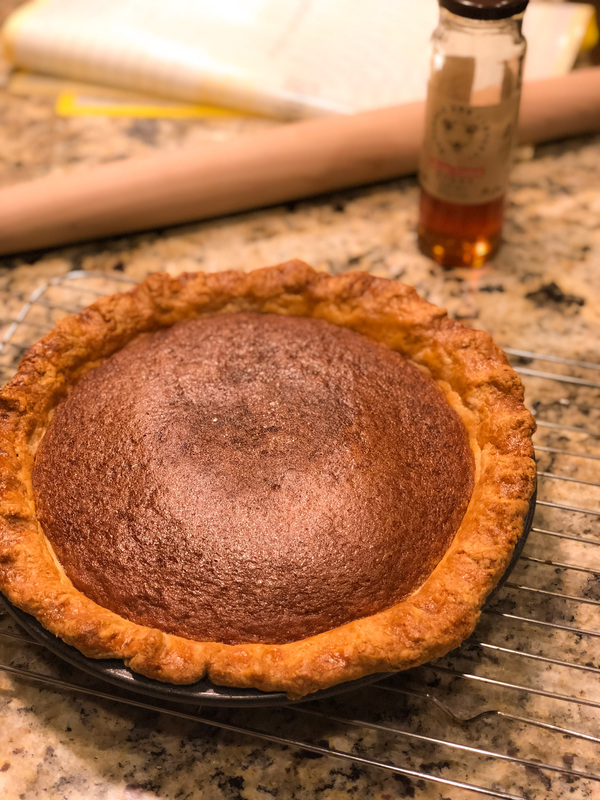 I cut most quantities in half, made a few tweaks here and there, and am happy to say that the cake flavor and texture I so loved is still there. But now the recipe results in a much more manageable final volume of cake batter. 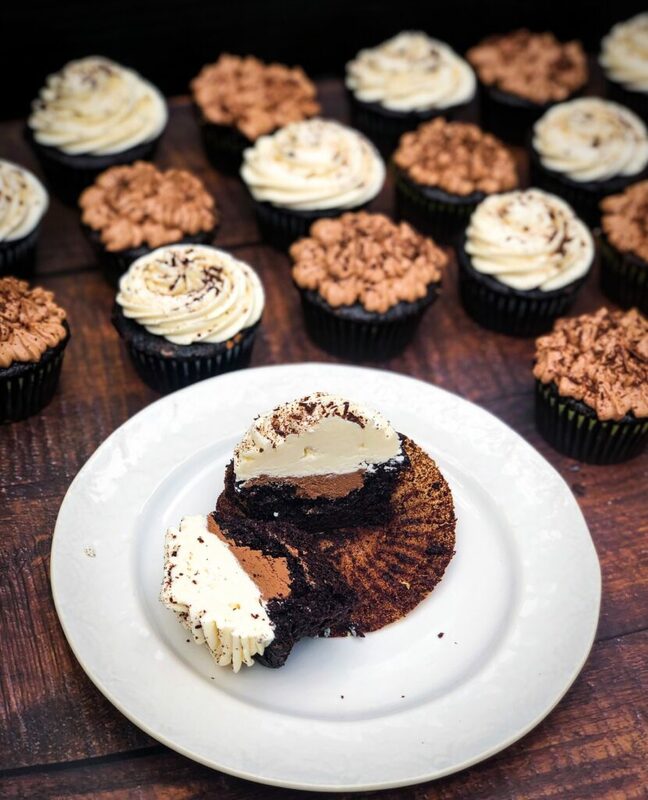 Have you ever bitten into a cupcake to find a surprise filling in the middle? Did you do a little happy dance in this moment? 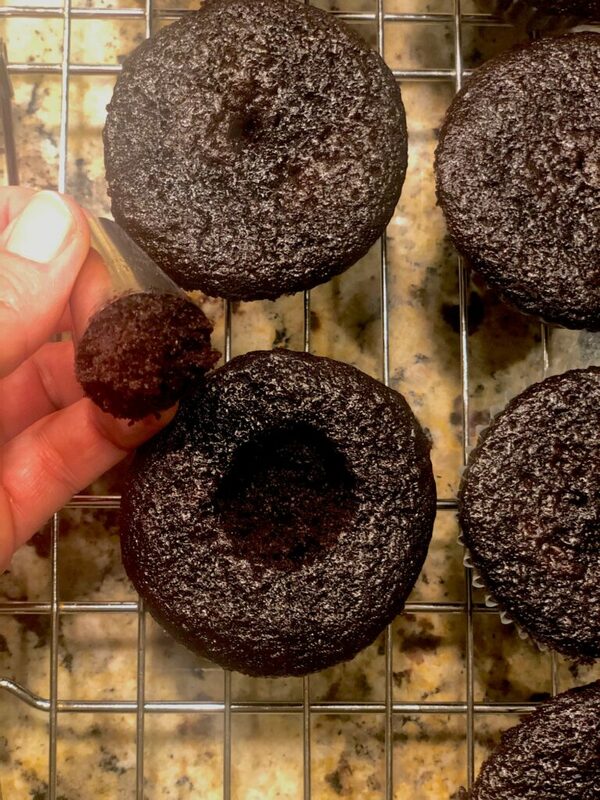 When trying to figure out the kind of cupcakes a Leprechaun might make, I decided that little green sprite would most definitely hide a treat inside. In this case, that treat would be a soft chocolate truffle – spiked with some Irish Cream liqueur, of course. This truffle really isn’t difficult to make – you don’t even need a candy thermometer. You do however, need to keep a watchful eye while you’re heating the cream that will eventually melt the chocolate chips. You want to heat the cream until just the point before it would start to boil. And then add the chocolate and give it a minute to do its melty magic before you start to stir. At this point, you’ll just need some patience. As Mary Berry often says, “chocolate melts in a child’s pocket.” So be willing to spend a few minutes stirring and allow the melting to happen. If you still see lumps, return the saucepan over low heat for a few seconds at a time, and then stir again. Once smooth, the chocolate mixture is ready to be whipped into its truffle destiny. 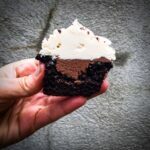 Even easier than the truffle, is this Irish Cream-spiked American Buttercream. Make sure your butter is really nice and soft (but not microwaved or melted) and do whip it for a good five minutes. Then gradually sift in your powdered sugar – especially if you plan to pipe the icing – as this will help keep it smooth. Again, whip this for a few minutes until nice and smooth. 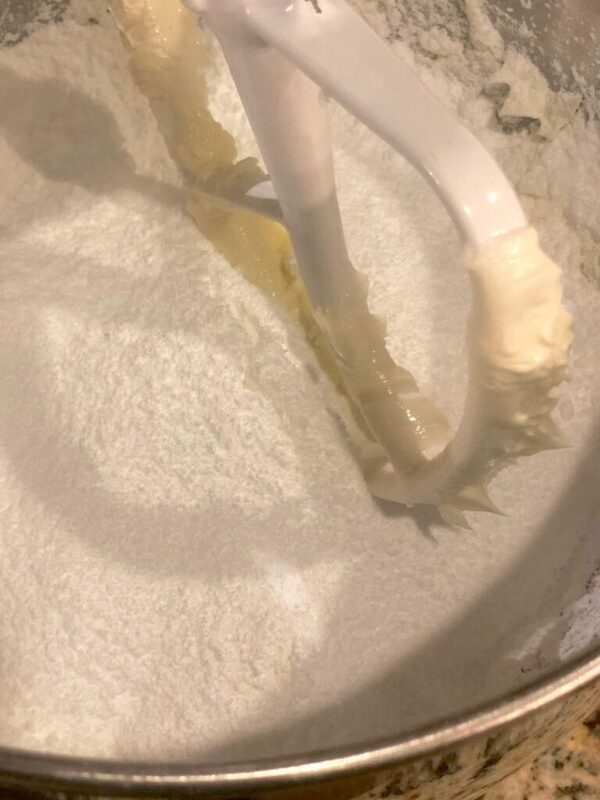 Now, for a typical American Buttercream, this is the stage to add flavoring like some vanilla extract and either some heavy cream or milk (a tablespoon at a time) until the icing has reached your desired consistency. When you’re adding booze to icing, I recommend taking a similar approach. 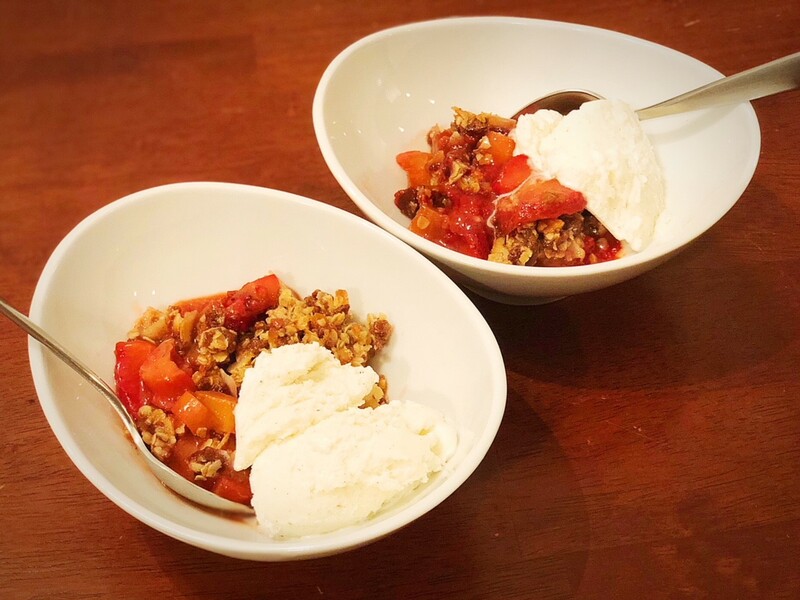 Add a tablespoon at a time, mix well and do a quick taste test until you reach your personal preference for “boozy-ness.” If you reach the level of flavor you want, but the icing is still too stiff, then switch to adding a splash of milk or cream until you reach the right consistency. For me, three tablespoons of Irish Cream liqueur was all I needed to hit both my flavor and consistency goals, but I highly encourage you to experiment with what works for you. And that’s it! Once you have all your components made, just follow the assembly instructions in the recipe below. Add some flair with sprinkles or shaved chocolate on top. Throw in some variety by icing some of the cupcakes with a whipped combo of the truffle filling and buttercream (see recipe notes below) if you wish. And then share these decadent cupcakes with friends to show them what’s really in that “pot o’ gold” at the end of the rainbow. Preheat oven to 300* F. Fill cupcake tin with liners of choice. Pour coffee over chocolate coins. Allow to sit for 4-5 minutes. Whisk together until chocolate is incorporated into coffee. Add in oil, melted butter, vanilla, buttermilk, and salt. Whisk together until combined. Add in egg and egg yolk and mix well. In a separate bowl, sift together flour, cocoa, baking soda and baking powder. Add to wet ingredients and stir until mixture is no longer lumpy. This may take a few minutes, but stick with it. 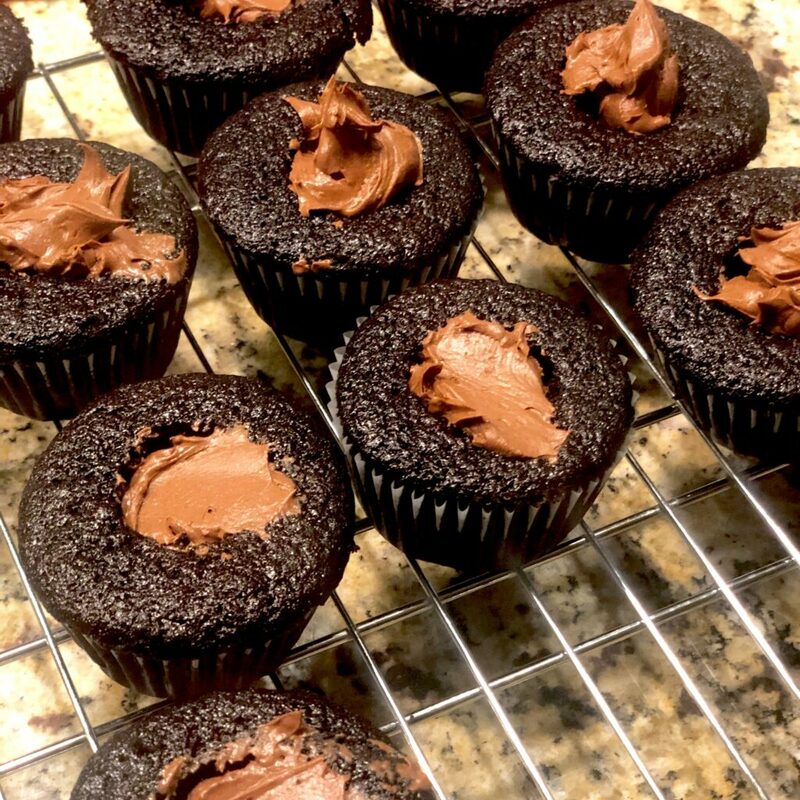 Fill each cupcake liner slightly more than ½ full with batter. Bake for 20-25 minutes, or until a toothpick or cake tester comes out clean. 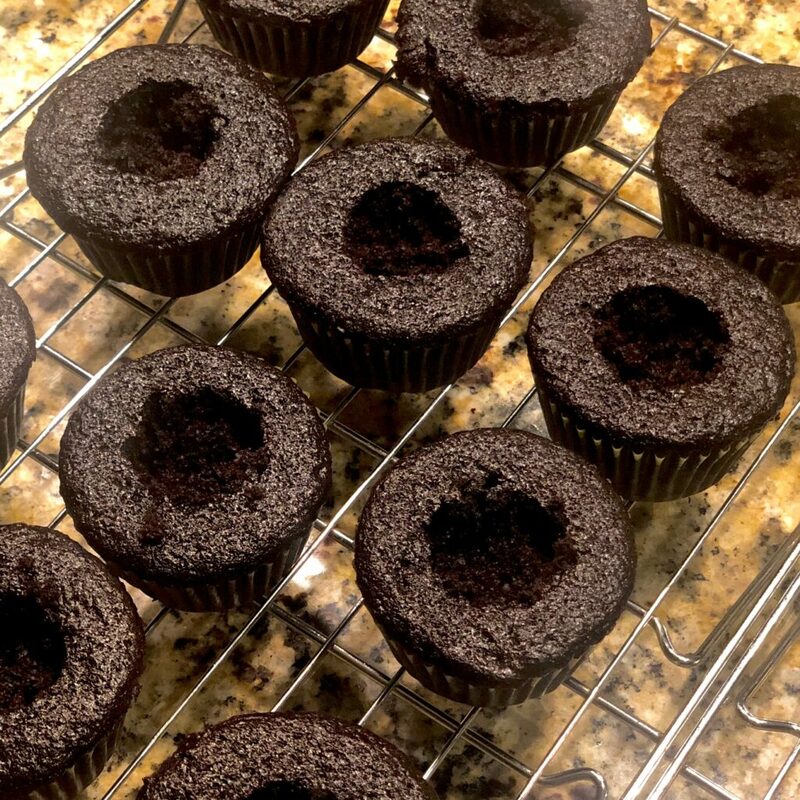 Let cool in pan for 5-10 minutes before removing cupcakes to cool completely on a wire rack. Heat whipping cream in a small-medium saucepan (preferably with a heavy bottom) over low-medium heat, whisking frequently. Watch this carefully – you want to heat the cream but DO NOT let it reach boiling point. As soon as you see movement of a few “below the surface” bubbles, remove from heat. Pour in chocolate chips and butter. Allow to sit for 30 seconds, then stir together with a spatula until glossy and smooth. Be patient with this stirring – the heat should eventually melt all the chocolate. If you find that you still have lumps, return the saucepan to low heat for 15-30 seconds, stirring constantly. Remove from heat again and stir until smooth, repeating as necessary. Transfer chocolate to a stand mixer and beat with paddle attachment for 5 minutes until bowl feels cool and chocolate is expanded in volume and thick enough to hold some shape (soft peaks is fine). Add Irish Cream liqueur and whip for 2-3 additional minutes. Transfer to a smaller bowl, cover and place in fridge to firm up further. I find an hour is usually plenty of time. Place 2 sticks (1 cup) softened butter in bowl of stand mixer with paddle attachment. Whip for 5 minutes until light and fluffy. Sift in powdered sugar (sifting is a must!). Mix on low until combined and then increase speed and whip for 2-3 minutes until fully incorporated and fluffy. Add in Irish Cream liqueur and whip for another 2-3 minutes, scraping down bowl as needed. Transfer to piping bag, if using. This cake recipe produces a very tender and moist crumb, which is delicious, but sometimes a bit delicate in cupcake form. This is especially true when the cupcakes are warm or at room temperature. I find it’s helpful to chill these in the fridge before filling and decorating. Not necessary, but helpful. 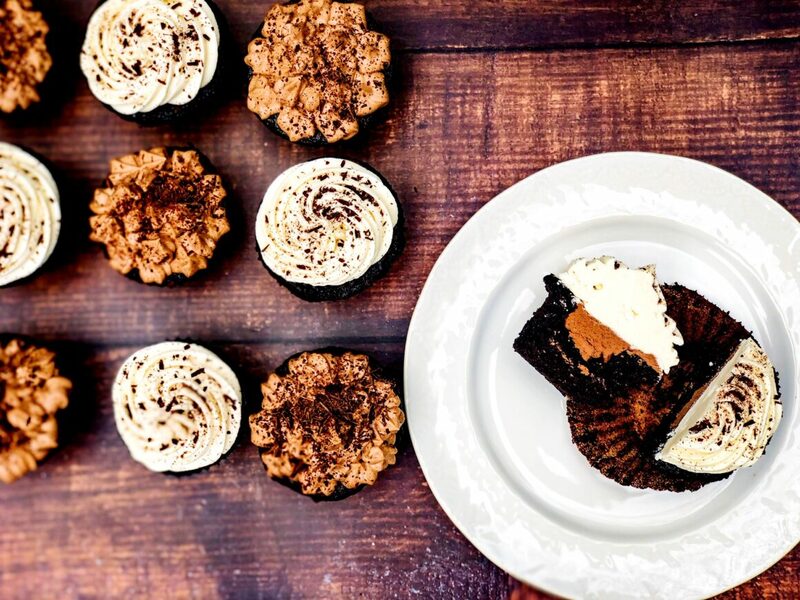 Using a large piping tip or small spoon (or melon ball scooper), scoop a ball of cake from center of each cupcake. Place a heaping teaspoon of Chocolate-Irish Cream truffle into each hole. Smooth down with a knife, if needed. Ice top of cupcakes with Irish Cream Buttercream, either smoothing icing over with a knife, or piping design of choice on top. 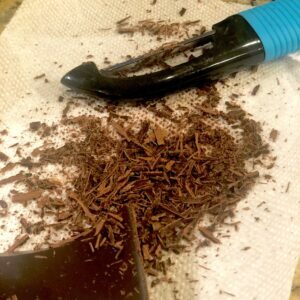 If desired, garnish with chocolate shavings. Note: The truffle recipe makes more than enough filling for the cupcakes, so if you want to vary your icing types, do the following. 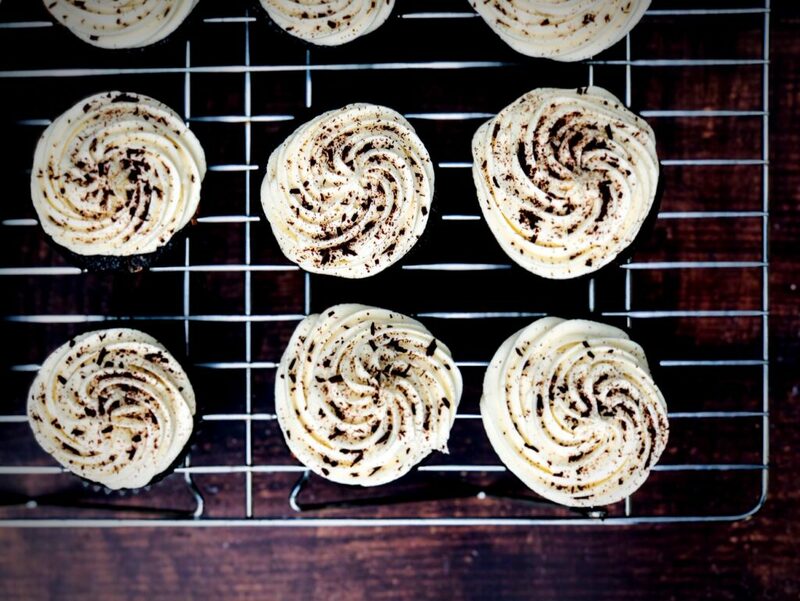 Make one batch of Irish Buttercream as directed above and frost half (~12) the cupcakes. 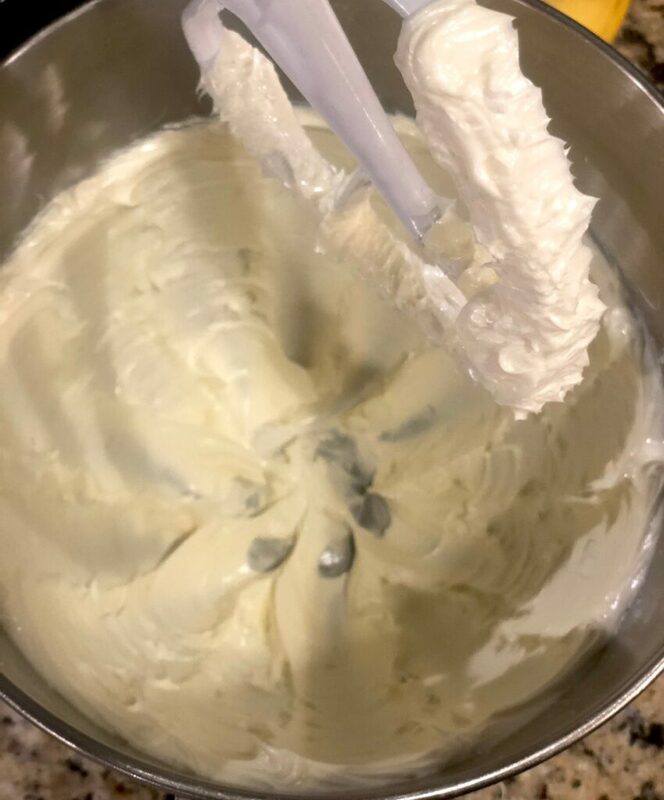 Combine any remaining buttercream with the remaining Irish Cream Chocolate Truffle cream in the bowl of your stand mixer and whip with a paddle attachment for 3-5 minutes until increased in volume and fluffy. Then decorate the remaining cupcakes with this frosting mixture.